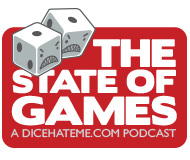 For the past couple of years, Dice Hate Me has covered the Kickstarter beat very closely. That means we’ve seen more than our fair share of prototypes, and been privy to the behind-the-scenes stories of many remarkable projects. Other than our own projects, none have been more familiar to us in details and development than the recently-launched Mars Needs Mechanics. We first met designer Benjamin Rosset at the 2011 World Boardgaming Championships in Lancaster, PA. While there, I had a chance to try out one of his more ambitious designs, the simultaneous turn selection/time management survival game, Stranded. Our friend Shawn, however, also got the chance to play Ben’s unassuming but unique economics game, The Market – and he loved it. Shawn wasn’t the only one, as another playtester at the convention offered Ben 20 bucks if he would make another prototype and send it to him. Ben, of course, jumped at the chance. It still stands on record as his first game design sale. 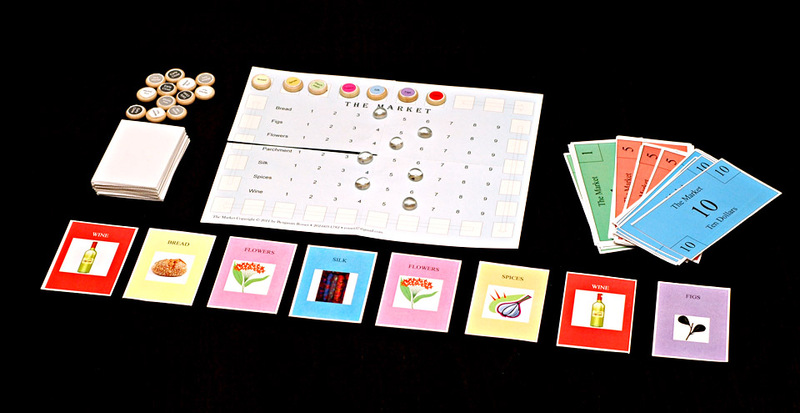 After the WBC, Ben sent Monkey and me a copy of The Market to see what we thought – and what we thought was that it was pretty brilliant, especially for such a simple concept. 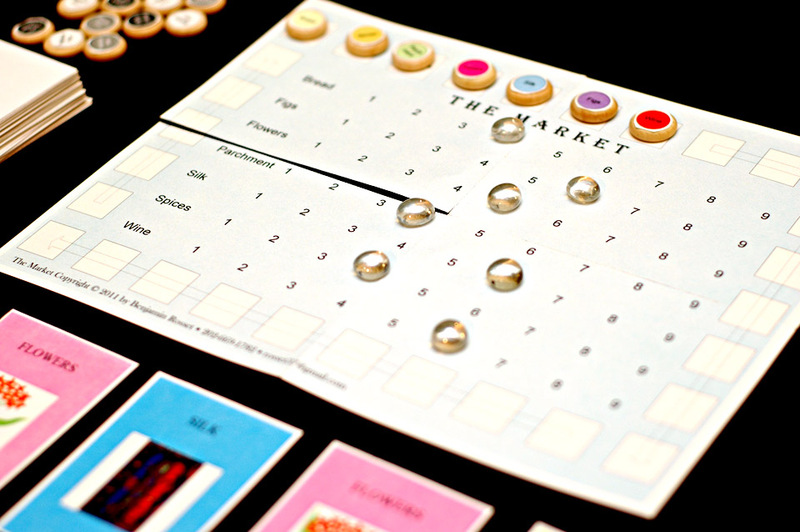 The core mechanic of the game was elegant and put a unique spin on an economics engine – a sliding scale dictated the price and demand of goods depending on what and when players bought said goods at the market. Players could sell the goods they bought at the end of the market day as long they sold them in sets of three or more, all with the hopes that they could manipulate the economic slider during the game to sell the goods for the highest profit. It was that constant give and take on the slider, and working to second-guess your opponent’s moves, that proved to be the memorable beating heart of The Market. The economics slider - the beating heart of The Market. A few months later I ran into Ben again at PrezCon in Charlottesville, Va. He had updated versions of Stranded and The Market with him, and we ended up playing a very spirited game of the now-Kickstarted Chicken Caesar from Nevermore Games, with co-founders Bryan Fischer and John Sizemore overseeing the fowl play. During the con, Nevermore took a good look at The Market and wisely decided that they loved it, too. And, lo, after several development discussions and a few key tweaks, Mars Needs Mechanics was born. Now, knowing what I know of the birth and rebirth of The Market, does the Mars Needs Mechanics makeover strengthen the strong engine at its heart or fill it with bloat that overshadows the elegant simplicity of its scope? There are pros and cons, but for the most part, Mars makes a much more fulfilling and robust gaming experience than did The Market. 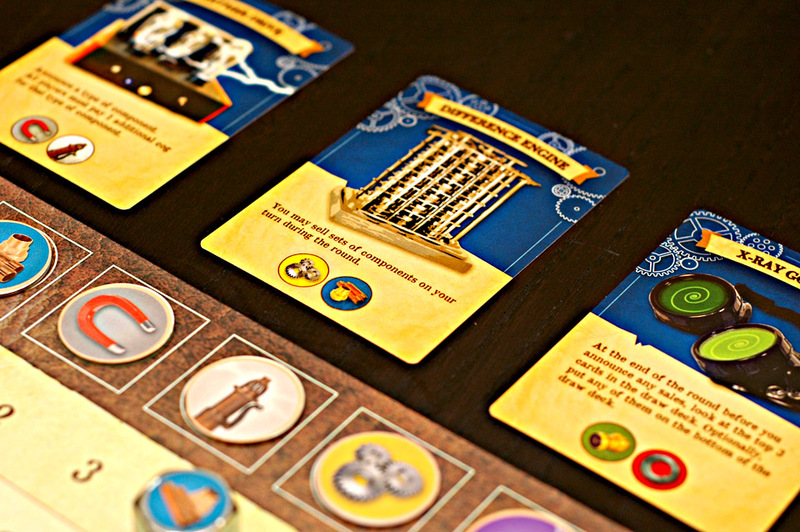 One of the best new bits that Nevermore has added to the mix are the mechanisms – steampunk constructs that can be built using the goods purchased at the steambits emporium and that grant a player special abilities during the game, such as being able to sell goods before the close of the market. 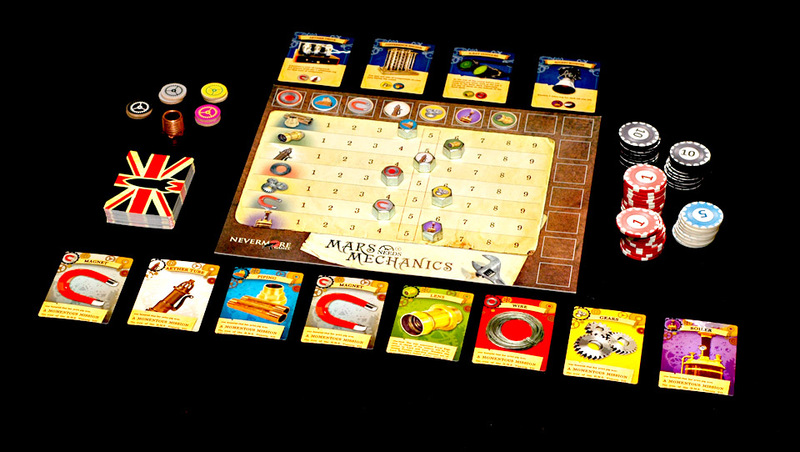 A couple of these constructs are holdovers of a token mechanic from one of Ben’s older iterations of the game, but the twist is that now players have to choose whether to build a certain mechanism to give them a possible upper hand or sell the parts for cogs – the chosen currency at the British Royal Academy of Space Exploration. I’ll readily admit that I’m not the greatest fan of economic engines. I much prefer to get my money in games the old-fashioned way – by swindling the most gullible player out of theirs. But then I married Monkey238 and I had to learn to step up my economy skills. The Market was a sort of turning point for this; in order to stay competitive, I had to pay more attention to the subtle changes on the economic slider and try to minimize my buying price and maximize my selling price. Surprisingly, the easy-to-grasp mechanics and somewhat-relaxed atmosphere of The Market facilitated this change of heart. That same atmosphere permeates Mars Needs Mechanics. The game is approachable, very easy to learn, and, most importantly, fairly easy to remain competitive in even with some players with, shall we say, a calculator for a brain. In summary, there are many pros and a few cons to Mars Needs Mechanics. Overall, I’m very proud to have watched The Market as it evolved into Mars Needs Mechanics, and even more proud to be a backer of the Kickstarter project. Don’t let your fear of economics engines – or wariness of another steampunk-themed game – make you shy away from checking out this unique and memorable project from a very promising up-and-coming designer. 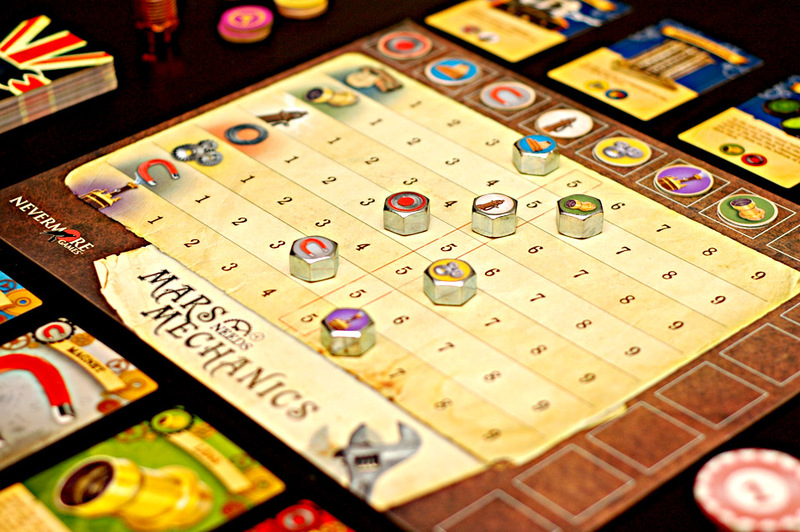 Mars Needs Mechanics is a game for 2 to 4 steampunk engineers, by Benjamin Rosset for Nevermore Games. It is currently available for support and pre-order sales on Kickstarter. I like the look of this game. Very well done. Now, I also understand why the forum is on a 3 page discussion about the theme being, well, being what it is. A bit pasted but cute. I am fine with that as theme is secondary to gameplay and mechanics for me. Wow, that does look sensational (the great photography doesn’t hurt either)! This is now officially added to the UniForge “watch list”. Don’t forget to mention he also had THE MARKET at Unpub2 in January. Actually, there was a ‘scout’ who emailed John to watch THE MARKET and send them a copy of the feedback forms. It wasn’t Nevermore, but it shows what a splash that title had made prior to being picked up. I didn’t know game companies sent out “scouts.” You just never know . . . Nice look at an exciting new game! There was a what? A scout at unpub2? My head just exploded. I also did sell a copy at unpub2 but not to a scout….I don’t think. Ben demonstrated Mars Needs Mechanics to me at WBC this year, and I really loved the sliding market price mechanic. It’s a really clever device for reflecting the impact of the players’ timing on commodity prices. I had a hard time figuring out the best way to take advantage of mechanisms and knowing when to construct them … but I’m never good at identifying strategies the first time I play through a game. I look forward to seeing more of MNM.